TV Drug Ads Distract Doctors And Patients : Shots - Health News Doctors spend lots of time answering questions about the latest drug ad, and that means less time answering questions that could really help your health, a primary care physician says. As I stood up to end our visit, Frank indicated he had one more question. "You know those commercials for Cialis?" he asked. "Would that be all right for me to try?" Here we go with the bathtubs again, I think to myself. Toned silver-hairs in side-by-side bathtubs on a deck somewhere looking out at the sunset. It's not always drugs for erectile dysfunction. I've been asked about TV spots hawking pharmaceuticals for nail fungus, depression, acid reflux, cholesterol and irritable bowels, just to name a few. Two decades ago the Food and Drug Administration loosened restrictions on advertising prescription drugs on television. Prior to that, the only ads we saw for brand-name drugs were targeted directly at us doctors, the keepers of prescription pads, and placed in the medical journals we read and in the detailed handouts given to us by pharmaceutical reps. So for 20 years now, we have borne witness to an ever-growing number of drug ads that are targeted directly at consumers. If you're among the 99 percent of Americans who watch television, you've seen scores of them by now. No time slot of television is immune: Drug ads are rampant on daytime TV, unavoidable during the evening news, all over sports programming, and have even crept steadily into prime time. Lately the trend has been toward advertising more expensive drugs for less common conditions, such as costly new immunotherapy drugs that could help only a tiny fraction of cancer patients. When I see one of these types of commercials I usually think, "How many people even have this condition?" Sometimes, I must admit, I've never heard of the condition or the drug, and have to look them up. That's one goal of these commercials — health professionals watch TV, too. Pharmaceutical firms can hawk their products to both sides of the prescribing relationship. But as a general internist, I'm never likely to prescribe most of the newer medications I now see advertised. Those drugs are going to be recommended by a subspecialist like an oncologist or rheumatologist. Yet many of those conversations still start with primary care doctors like me. Advertisers count on it. It's all in the math. Whether a pharmaceutical firm sells a niche drug for a rare condition at a high price or a blockbuster drug for a common condition at a more reasonable price, it behooves us to remember that drug companies advertise for a reason: profits. Like many doctors, my problem with direct-to-consumer ads is that the game never really feels like a fair fight. Sure, there are purported benefits: Patients get better information about what's available out there. The ubiquitous phrase "Talk to your doctor" has led to more and better conversations about topics that may have been hard for patients to bring up or doctors to ask about. Probably the best example is patients willing to consider an antidepressant when previously they might not have even wanted to discuss their mood. Other suggested benefits include adherence to a treatment regimen and a lessening of stigma for certain diagnostic categories. Particularly for mental health conditions, this has moved the national conversation forward as sufferers may be more likely to come out of the shadows. But all too often, commercials give us the idea that something might be wrong with us. Big budget ads have driven the promotion of new disease entities. When pharmaceutical firms get FDA approval for a new indication, they can relentlessly market the product and create a torrent of demand where none previously existed. And those helpful conversations I mentioned aren't always so helpful if they wind up hijacking time in our brief encounter. I'd like to discuss what's most relevant and beneficial to your health. If I have to spend my time fending off marketing for a condition you don't have or a drug that's of no possible benefit to you, our time hasn't been used productively. Further, the advertising of newer products means that they're generally more expensive than older, well-established drugs that might now be available as an equally effective generic. And good luck figuring out how much such a drug will cost you. If I do wind up prescribing it, more often than not it won't be "preferred" by your insurance. Then it's down the prior-authorization rabbit hole, which can require multiple calls from the doctor's office to the insurer, begging for coverage. If you want to see smoke come out of a doctor's ears, just ask about THAT process. 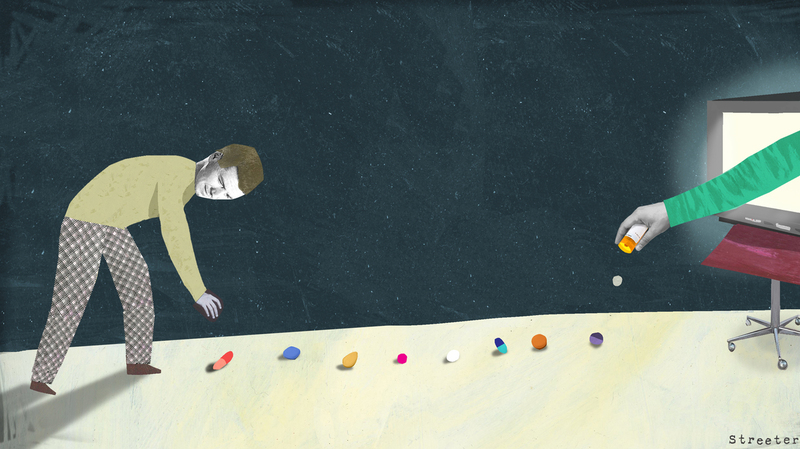 Finally, newer drugs don't have the track record of drugs that have been on the market longer, which means we don't always know if they are as safe as we would like. Remember the Vioxx story? Vioxx was a highly-touted anti-inflammatory pain medicine that was supposed to spare the lining of your stomach when used regularly, unlike its older, cheaper cousins like ibuprofen. Problem was, Vioxx turned out to increase the risk of heart attacks and strokes. The drug had annual sales of $2.5 billion before it was pulled off the market. Perhaps the saving grace of these drug commercials is that the FDA still requires advertisers to list potential side effects of their products. This has created an entire comedy genre, as the sotto voce reading of the lengthy list usually makes any of us that can hear it think: "Why would I take a drug that will give me a side effect that I took it to alleviate in the first place?" Those lists always make me think of my favorite parodic side effect, which afflicted Saturday Night Live's Kristin Wiig in a spoof ad for the anti-smoking drug Chantix: "jazz hands." John Henning Schumann is an internal medicine doctor and serves as president of the University of Oklahoma's Tulsa campus. He also hosts Studio Tulsa: Medical Monday on KWGS Public Radio Tulsa. You can follow him on Twitter: @GlassHospital.